is New York's premiere dental facility. "The dental office was immaculate and very cozy." "Super-efficient & organized. Hygienists are excellent, and the dentists are superb"
"A great dental experience...and the imaging capabilities are incredible." "The receptionists are nice and friendly. The ambience of the waiting area is so calming." "They gave great details about the procedure...have incredibly advanced tools/technology." "The staff and atmosphere at this dental office are truly superior." "From the moment you walk into the door it is a relaxing and an impeccable experience." Wall St Dental Spa is unlike any other dental practice. Conveniently located in the heart of the Financial District of New York City, Wall St Dental Spa is a luxury experience for its patients. Launched by Adriana Leone, DMD, in 2005, Wall St Dental Spa has always been a dental practice with a boutique flair. The office itself is comfortable, tranquil, and ultra-modern — a welcome change for patients who avoid going to the dentist at all costs. Wall St Dental Spa is equipped with state-of-the-art technology to create gorgeous, healthy smiles with an unmatched level of precision, comfort, and expertise. 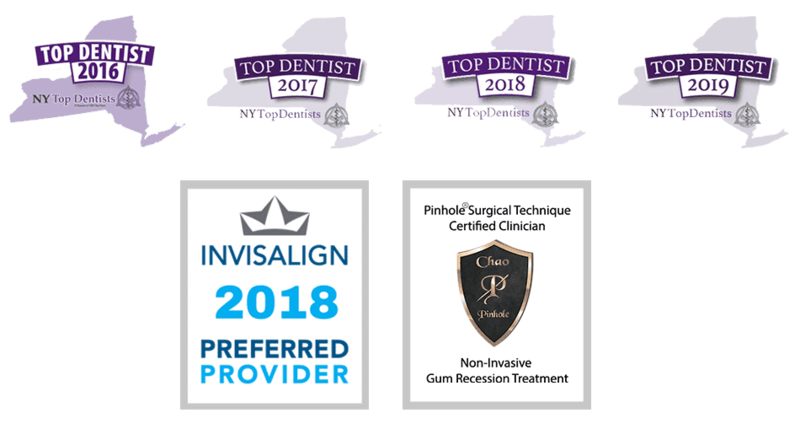 The well-educated staff is so beloved in the New York community that the practice consistently leads TOP Docs lists in the city. What truly sets Wall St Dental Spa apart from the rest is its beautiful spa-like facility, which provides an array of general and cosmetic dental procedures all under one roof — thanks to its experienced team of distinguished dentists, specialists, and dental hygienists. From porcelain veneers and oral surgery to in-office professional teeth whitening and dental implants, Wall St Dental Spa has everything patients need to look and feel their best. Call or book an appointment online today to learn more. Wall Street Dental Spa is a premier dental facility that provides tranquil spa-like atmosphere. We have succeeded in offering a high level of comfort to our patients while receiving the best service possible. All spa services are available with any dental treatment, free of charge. Come experience true relaxation and pampering at our dental office, and see why everyone loves coming here! Find out which fruit is the most beneficial to your oral health! "The hygienist was very friendly and did an amazing job with my dental cleaning. Dr. Angelique Freking was great, she explained everything very clearly and transparently"
"Wall Street Dental Spa was an excellent experience. Sijan explained everything to me and she was courteous, patient, and knowledgeable." "Excellent experience with a same day appointment for a chipped tooth. The team is very friendly and efficient. I waited maybe 5 minutes before being taken in." "Everyone at Wall Street Dental: the doctors, technicians and administrative staff, are very knowledgeable and personable." "I have been a patient of Dr. Leone for over 10 years and I have always found her professional and caring but most importantly, honest." "Dr. Boyd is an exceptional endodontist. She is highly skilled and has a wonderful ‘chair-side’ manner that puts even a nervous patient at ease." "Dr. Fernandez is a wonderful dentist. She explained everything in detail and made great suggestions."